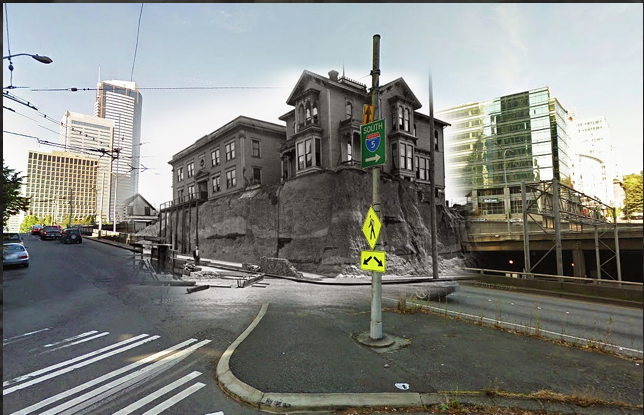 Over the past few days, several people have sent me a link to this wonderful set of Seattle then-and-now images by Clayton Kauzlaric. What he does that is unusual is to create a composite with an historic shot woven together with a Google street view. Images include the original shoreline, parades, and regrades. Perhaps the most iconic is this one of a house formerly at the corner of Sixth and Marion. 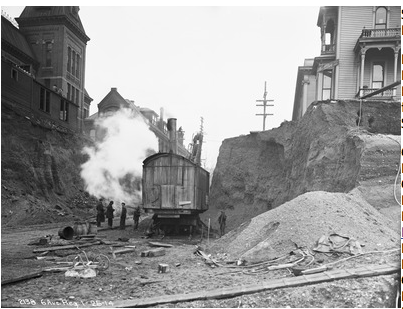 The historic photo is from the regrade of Sixth Avenue, which occurred in 1914. As reference, it is about eight blocks south of the southern end of the Denny Regrades, which took place in 1903, 1906, 1907, 1908 to 1910, and 1928 to 1930. Entrepreneur Joseph F. McNaught built this house around 1881. 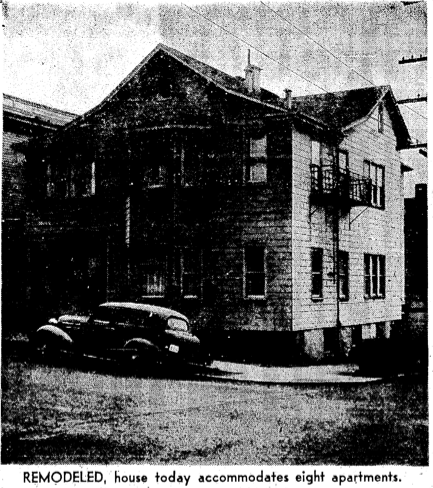 At the time, “the older men of Seattle shook their heads at this foolish whim,” wrote Margaret Pitcairn Strachan, in a story about the building in the March 4, 1945, Seattle Times, in part because the house sat on a “tremendous hill, along a cowpath.” McNaught’s home originally faced Sixth Street (later Sixth Avenue), with horse stalls and carriages to the south toward Columbia Street. In 1890, a regrade of Sixth left the house perched high above the street. When the house was lowered to the new street level it was turned ninety degrees, to face Marion. Dr. P.B. M. Miller and his wife Eva eventually bought the McNaught home from speculator Bert Farrar and converted it into a rooming house, which they named the Ross-Shire. Their children owned the building, known variously as the Ross-Shire Apartment, Ross-Shire Hotel, and Hotel Ross Shire, when the main regrade of Sixth took place in 1914. In this image from January 1914, you can see an excavator at work on the hill holding up the Ross-Shire. On the corner of the building is a sign advertising the Ross-Shire Cafe. Eleven years after the regrade, Harvey M. Todd bought the house. He made significant changes to the original structure, adding apartments, sleeping rooms, and a “modern hot-water heating system,” as well as lowering the yard to allow light into basement apartments. According to Paul Dorpat, the building ended its life when I-5 was built. By this time, it was part of a complex known as the Marion Hotel. I have one final comment and I don’t mean it to be too critical of the wonderful images created by Clayton Kauzlaric but I am a bit compulsive about trying to get the facts straight. His image faces the wrong way. 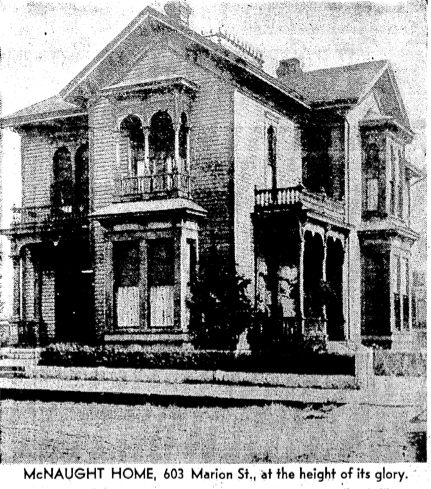 The McNaught house was on the southeast corner of Sixth and Marion and Kauzlaric’s image puts it on the northeast corner, or at least he has the image facing northeast. He may have done so for artistic reasons—the composite is framed beautifully—but to see a correct now-and-then shot, you can go to Paul Dorpat’s web site, which has some additional information about McNaught and the property. David I thik these photos and the story are terrific!